Dimensions: folded card measures 6 x 4.5 inches. This year, send the magic of the holiday season to those very special people in your life with this charming Christmas card! This beautiful and unique Christmas card is professionally printed with a scene from one of my original wool paintings. 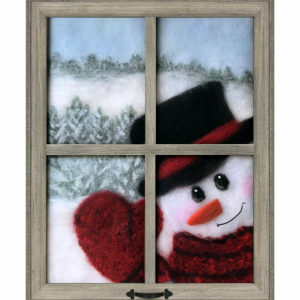 It features a cheerful snowman with a broom, who is wearing a fluffy red scarf and black top hat with a matching red band. There is black coal forming his eyes and a bright orange carrot used for his nose. More black lumps of coal decorate his white tummy. Buy just one card or snag a set if you’re planning to send your own unique season’s greetings to several people. Blank on the inside: you can add your own words on the greeting cards, warm the recipients with the best wishes and love. Envelopes included: send greeting cards to your friends and family in the mail! Fold flat to fit in a standard envelope for mailing. Superior quality: card is printed on high-quality glossy paper card stock for elegance and extra durability.